Treau is hiring: learn more and apply. 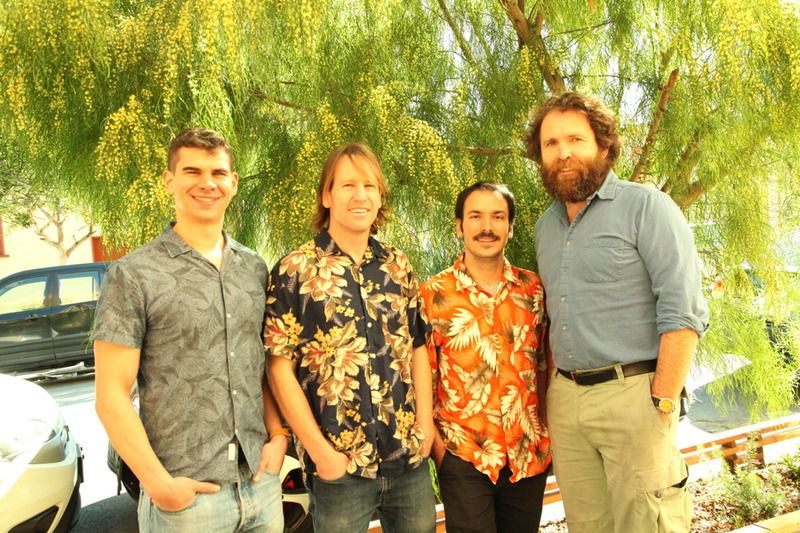 Cofounders Vince Romanin, Ph.D., Pete Lynn, Adrien Benusiglio, Ph.D., and Saul Griffith, Ph.D.
Treau is led by Vince Romanin with cofounders Adrien Benusiglio, Pete Lynn, and Saul Griffith, a team of thermo nerds from Otherlab, a San Francisco-based R&D laboratory. The team brings together scientists from heat transfer, thermodynamics, fluid mechanics, and materials laboratories at Berkeley, MIT, Stanford, and Ecole Polytechnique. Combined with Otherlab’s research in computational geometry, inflatable structures, rapid prototyping, robotics, and energy, we have developed a portfolio of technology for small-ΔT heat exchangers, compressors, and expanders, as well as a passion for decarbonizing the HVAC&R industry. Otherlab’s work in soft robotics, polymeric pneumatic actuators for solar tracking, and inflatable structures has been driven by innovative design of non-rigid materials, which will be essential in manufacturing and assembling robust and low-cost membrane heat exchangers, compressors, and expanders. Critical need: Heating, Ventilation, Air Conditioning, & Refrigeration (HVAC&R) account for about 15% of the United States’ energy use. Growing demand for air conditioning in emerging economies will mean a dramatic worldwide increase in energy use and emissions related to HVAC&R. Technology vision: We aim to cut HVAC&R energy intensity in half using inexpensive, lightweight polymer heat exchangers, compressors and expanders. Current state-of-the-art: Traditional heat exchangers are based on small, rigid, metal structures and ineffective convective heat transfer. Compressors have poor heat transfer and energy efficiency. Only modest performance enhancements are possible via surface structuring, flow modification, and advanced materials. Key innovation: Polymer membranes can have performance on a per-area basis equivalent to existing state-of-the-art heat exchangers, but their low mass, flexibility, and low cost enable them to support a higher functional surface area, dramatically reducing the convective barrier to heat transfer. Competing technology: Expensive surface-area microstructuring, extended surfaces, complex geometries, and advanced materials are common solutions to improving heat exchanger performance. Compressors with intercooling require several stages and costly heat exchangers. Low-cost and low-weight surface area enables dramatic, rather than incremental, improvement. Compressors and expanders can have integrated intercooling, lowering cost and increasing performance. First market hypothesis: HVAC&R is a large and rapidly expanding first market in which our product can provide significant energy savings. Isothermal compressors and expanders can enable refrigeration cycles without harmful refrigerants. Potential for impact: By reducing the energy of HVAC&R and other low-temperature thermal processes, the United States’ energy use can be reduced by up to 10 %, or 10 quadrillion BTUs annually. The potential reduction in future energy use globally is even greater due to the rapidly growing demand for HVAC&R systems in emerging economies.